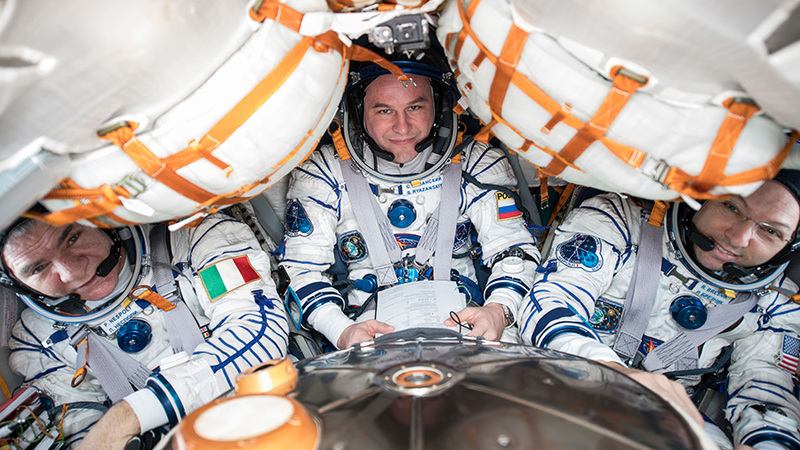 Expedition 52-53 crew members (from left) Paolo Nespoli, Sergey Ryazanskiy and Randy Bresnik are suited up for a test run of their Soyuz undocking and landing. The Expedition 53 crew is getting ready to split up Thursday morning before another crew begins its mission next week. Soyuz Commander Sergey Ryazanskiy will pilot his crew mates Randy Bresnik of NASA and Paolo Nespoli of the European Space Agency in the Soyuz MS-05 spacecraft back to Earth after 139 days in space. The trio is scheduled to undock from the Rassvet module at 12:14 a.m. Thursday and parachute to a landing in Kazakhstan at 3:38 a.m. The next space travelers to board the station will be veteran cosmonaut Anton Shkaplerov of Roscosmos and new astronauts Scott Tingle of NASA and Norishige Kanai of the Japan Aerospace Exploration Agency. They are the Expedition 54-55 crew and are in Kazakhstan in final training ahead of their launch Sunday at 2:21 a.m. Shkaplerov, flanked by Tingle and Kanai, will take a two-day trip inside the Soyuz to the station before docking Tuesday at 3:43 a.m. for a four-month stay at the station.